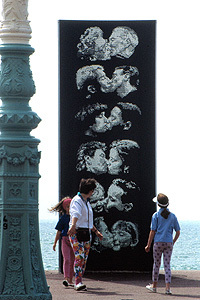 Public art has played an important role in the visual make-up of Brighton & Hove since the first commission in 1992. Our public art commissions build artists' skills and vision into the process of creating new spaces and regenerating old ones. The artworks include sculpture, photography, environmental land works, lighting, seating, street furniture and work built within larger architectural developments and buildings. All the artworks are site-specific and many projects include community involvement. Using innovation and experimentation these works celebrate Brighton & Hove's communities and landscapes. They increase the use of open spaces and create important environments for residents and visitors, insuring a cultural legacy for the future. You can also get information on visiting the works from our public art trail guides and view all the public art pieces on a Google map. 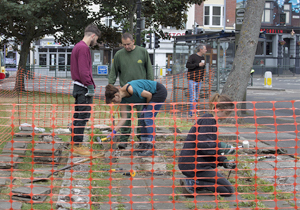 In January 2015 Spacemakers, who describe themselves as a utopian regeneration agency based in Brighton won the £70,000 section 106-funded public art commission to enhance the London Road regeneration area. Their Brighton School proposal sought to provide an opportunity for talented graduates to remain working in their subject field. Spacemaker’s Brighton School proposal was conceived by Matt Weston, Tom James and Andy Felton. The public art commissioning panel included: Paul Campbell, BHCC Parks department; Donna Close, BHCC Head of Arts; Branwen Lorigan, Project Manager for the EU Recreate project; Elspeth Broady, a Friends of Ditchling Rise representative; Rev. Phillip Wells, Chair of the London Road Area LAT; Jim Mayor, BHCC Project Manager, Laura Coleman, Founder & Co Director of ONCA gallery. 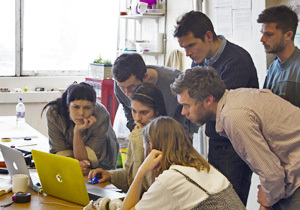 From sixty University of Brighton applicants, five graduates were chosen. They were Alex Nunn (filmmaker), Isabella Poadpade (painter), Malcom Bradly (sculptor), Martina Mina and Roz Wells (architects). These five graduates formulated the concept of The London Road Stone Circle. The inspiration for the Stone Circle came from the group’s discovery of fifty York paving stones, which had been discarded for regeneration outside St Peter’s Church. Graduate Isabella Poadpadec produced a drawing that incorporated the York stones. Her idea was to develop a new ‘myth’ for the area, combining something old and something new. From this point the graduates had a focus: the school would lay the stones in a new circle which would be as wide as the road is long, passing through public and private space. Matt Weston, Director at Spacemakers. Text written by Lucy Kearney University of Brighton placement student. 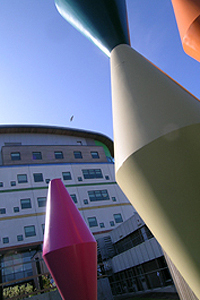 These trails invite you to explore public artworks in and around Brighton & Hove. Click on the trail link for a map, directions and images of the artworks you will visit. Bus numbers are included in the trail directions but for more information on getting around the city visit: www.journeyon.co.uk. 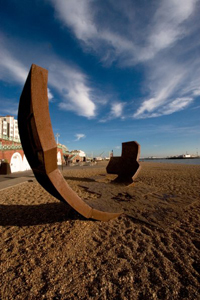 This trail begins at Brighton train station and concentrates on the public art in the city centre and along the seafront. This trail is designed to follow on from Public Art Tail 1, in to the east of Brighton. This trail is based in Hove and is aimed at those wishing to go on a longer walk, for experienced road cyclists and those using the bus services. This trail is designed for night time explorers and gives you chance to fully appreciate some of the artworks in the city that use light and illumination. Use our Google maps RSS feed for the Public Art Trail to stay informed when new trail pieces are added.